Super Easy - 5 Ingredient - Pumpkin Bars! 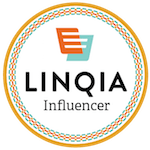 | Happy Deal - Happy Day! Super Easy – 5 Ingredient – Pumpkin Bars! I made these super easy, 5 ingredient, Pumpkin Bars for a snack for my local chapter of MOPS last week. YUMMY and EASY!! Mix the Spice Cake Mix with the 1 can of pumpkin (seriously….that’s it!). Stir it well (it will be thick) and spread into a greased 9X13 baking dish. Bake at 350 degrees for 25-35 minutes until toothpick comes out clean. Mix the instant vanilla pudding mix with 1 cup of milk (should be one half of the recommended liquid). When that is mixed, fold in the Coolwhip until well mixed. Spread this frosting over the pumpkin bars. Sprinkle with cinnamon on top if you’d like. Betty Crocker Spice cake mix = $1.49. Use the $0.75 off TWO Betty Crocker Frosting or Mix coupon and they will be $.74 each after the doubled coupon. I’m not going to count the price of milk or cinnamon because everyone probably has a cup of milk on hand and the cinnamon is optional. Total = $3.82 and took about 10 minutes of prep time. Super Easy - 5 Ingredient - Pumpkin Bars! Mix the Spice Cake Mix with the 1 can of pumpkin (seriously....that's it!). Stir it well (it will be thick) and spread into a greased 9X13 baking dish. Bake at 350 degrees for 25-35 minutes until toothpick comes out clean. Mix the instant vanilla pudding mix with 1 cup of milk (should be one half of the recommended liquid on the box). When that is mixed, fold in the Coolwhip until well mixed. Spread this frosting over the pumpkin bars. Sprinkle with cinnamon on top if you'd like. 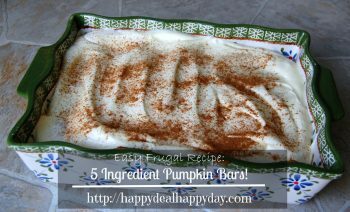 I’d say these pumpkin bars are an awesome dessert to make this time of year because of cost and ease, and most importantly TASTE! Find more easy, frugal recipes over here! ← Sunday Coupon Preview Week of 10/6/13 – 3 Inserts! 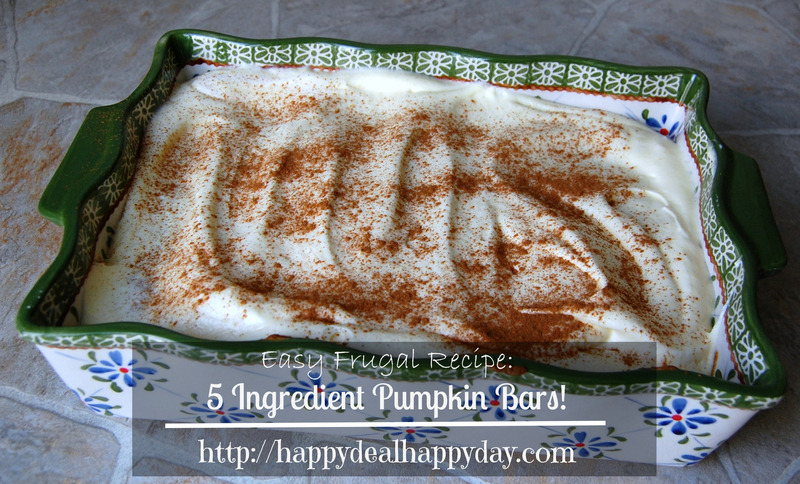 4 Responses to Super Easy – 5 Ingredient – Pumpkin Bars! 15 oz can of pumpkin!